What is the Agata furniture warehouse like in Poland? Agata has equipped its latest warehouse in Majków Duży (Poland) with a selective pallet rack system by Mecalux. Both the single and double-depth racks provide a storage capacity of more than 50,000 pallets of various sizes and volumes, doubling its previous capacity. This solution guarantees swift goods organisation and perfect stock control. Founded in 1952, Agata is one of the primary furniture distributors of Poland. With more than 60 years in business, the company became a completely Polish funded corporation. Nowadays, Agata owns 24 superstores spread throughout the entire country. Besides carrying an impressive range of furnishings, its catalogue also includes home decor products, as well as kitchen design. The expansion of Agata’s retail network has meant a climb in product demands over recent years, forcing the company to move its old warehouse to Central Poland, where it could easily supply its national shops. The new distribution centre opened up in 2017 in Majków Duży (Poland). The company needed a storage system that would permit the management of a large number of pallets with different rotations and characteristics and that, in addition, would streamline order preparation to supply its points-of-sale quickly. Bearing these factors in mind, Interlake Mecalux supplied 28' and 29' high single and double-depth pallet racking, measuring approximately 942' long. The single-deep racks, of five or six load levels high, are allocated to medium consumption products (type B and C). Meanwhile, the double-deep block, with four levels, houses consumer goods (type A) such as upholstered furniture. Compared to single-depth ones, double-deep racking meant more storage on each level. This solution features piggybacked pallets of the same SKU in each location, one behind the other. These are a perfect match for Agata, since they can store variable sized and weight pallets. This system facilitates direct access to the goods, which eases storage and picking work. Moreover, perfect stock control is guaranteed, as each location is allocated to a single SKU. Due to centre's massive size, an underpass was opened that cuts across the racks allowing the flow of personnel, as well as fulfilling the need for an emergency exit. The levels above this passageway are fitted out with electro-welded mesh to prevent the accidental fall of materials. On the other hand, consoles are enabled at the ends of the racks, which increase storage capacity and stop excessive pallet placement at the floor-level. Forklifts are the primary handling equipment operated in this warehouse to insert and extract pallets from their locations. These pieces of equipment are known as versatile, speedy pallet handling machines. The double-depth racks are operated by forklifts that feature extendable forks able to insert themselves into a second pallet location. Plus, they can adjust to handle large pallet sizes. The aisles are just the right size to facilitate forklift manoeuvres and the operators picking items with order picking machines. These machines have an operator cabin and extra-long forks to shift very large pallets. Operators crisscross the warehouse locating the SKUs for each order, as instructed by the warehouse management software (WMS) via a radiofrequency device. 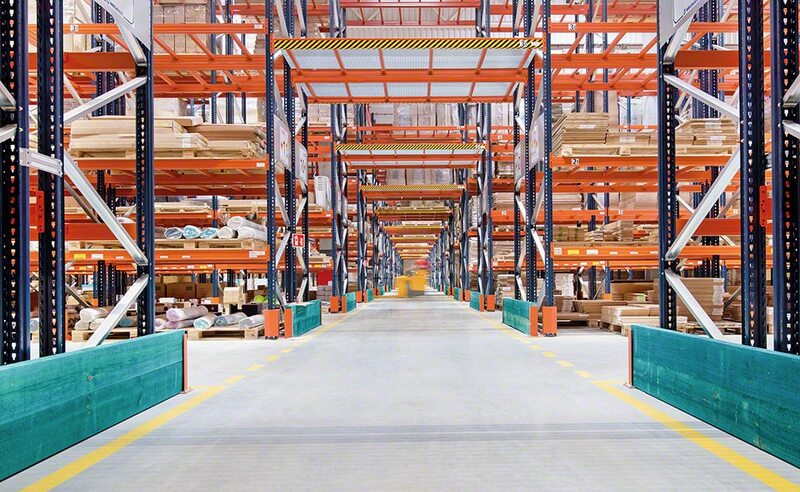 The docks are located on the two opposite sides of the warehouse, to minimize the movements of operators and assist the receipt and dispatch of the goods. A wide reception and dispatch zone is set up in front of the docks. Ground-floor pallet grouping from the same order or route speeds up the subsequent loading of carrier vehicles. Maximum storage capacity: the new Agata logistics centre can house 50,000 pallets of 32" x 48". Optimal stock management: the direct access to goods streamlines storage and order prep tasks. Versatility: the pallet racks can accommodate pallets of different sizes and volumes.